The mechanical behavior of concrete materials is strongly influenced by its microstructure. The macroscopic properties of concrete materials such as strength and stiffness are dependent on the properties micromechanics. The advance of composite mechanics and advanced computing technologies has made possible the micromechanical analysis of concrete materials.. In the first status of micromechanical modeling with special emphasis on the advantage and disadvantage of each model is presented. The current paper focuses on the geometrical description and numerical simulation of normalweight concrete at the mesoscale. In the first part the numerical representation of concrete at the mesoscale is introduced. The internal structure of concrete is considered at the micro level, and is treated as a three phase material comprised of aggregate particle, matrix, and the aggregatematrix interfaces The generation of the mesoscale geometry, the finite element discretisation and the applied material laws Whit micro plane theory are described. The main objective of this paper is to investigate the macroscopic behavior and Progressive failure of concrete materials under static loading, as influenced by the properties of its constituents at the meso level. Concrete is one of the most popular construction materials, and people have been Using it for long time. Many models, theories and numerical techniques have been developed to represent its mechanical behaviour, including a large variety of constitutive models, damage models and other novel developments such as the micro plane model. However, progressively more elaborated constitutive relations have also required a large number of parameters, sometimes difficult to obtain and with no clear physical meaning. In the 1980s, the meso mechanical approach, sometimes known as numerical concrete, was proposed by roelfstra et al, and then was followed by others . 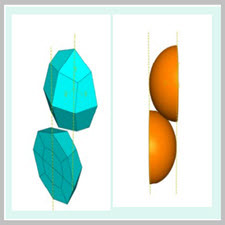 It consisted of discretizing the first level of material (meso structure) and assigning to each material component its individual geometry and properties. There is no doubt that the complexity of the nonlinear behaviour of concrete may be largely associated to its heterogeneity and components. Therefore,it seems reasonable that onsidering explicitly each material component(geometry and mechanical properties) will allow us to consider simpler constitutive assumption in exchange for an increasing size of the global problem. رفتار مکانیکی مواد بتنی به شدت توسط ریز ساختار آن تحت تأثیر قرار می گیرد. خواص ماكروسكوپي مواد بتني مثل مقاومت و سختي بستگي به خواص ميكرومكانيك دارد. پیشرفت مکانیک کامپوزیتی و تکنولوژی های پیشرفته محاسباتی، امکان تجزیه و تحلیل میکرومکانیکی مواد بتنی را امکان پذیر کرده است. در اولین حالت مدل سازی میکرومکانیکی با تاکید ویژه بر مزیت و ضعف هر مدل ارائه شده است. مقاله حاضر بر توصیف هندسی و شبیه سازی عددی بتن سبک وزن در مقیاس مكان تمركز می كند. در قسمت اول، نماد عددی بتن در مقیاس مفهومی معرفی شده است. ساختار داخلی بتن در سطح میکرو در نظر گرفته می شود و به عنوان یک ماده سه فازی شامل ذره، ماتریس و واسط گرافیتی مشتق شده محسوب می شود. نسل هندسی mesoscale، discretisation عنصر محدود و قوانین مواد اعمال شده، نظریه توصیف شده است. هدف اصلی این مقاله بررسی رفتار مغناطیسی و شکست پیشرونده مواد بتنی تحت بارگذاری استاتیک است که تحت تاثیر خواص اجزای آن در سطح meso قرار دارد. بتن یکی از محبوب ترین مصالح ساختمانی است و مردم برای مدت طولانی از آن استفاده می کنند. بسیاری از مدل ها، نظریه ها و تکنیک های عددی برای نشان دادن رفتار مکانیکی آن، از جمله انواع مختلفی از مدل های سازنده، مدل آسیب و دیگر تحولات جدید مانند مدل میکرو هواپیما، توسعه داده شده است. با این حال، روابط سازنده ای که به تدریج توسعه یافته تر نیز نیاز به تعداد زیادی از پارامترها، گاهی اوقات دشوار برای به دست آوردن و بدون معنای فیزیکی روشن است. در دهه 1980، روحیه مکانیکی مکانیکی، گاهی اوقات به عنوان بتن عددی شناخته می شد، توسط roelfstra و همکاران، و سپس توسط دیگران پیشنهاد شد. این شامل تشخیص اولین سطح مواد (ساختار meso) و اختصاص دادن به هر جزء مادی هندسه و خواص فردی آن بود. شکی نیست که پیچیدگی رفتار غیرخطی بتن ممکن است تا حد زیادی به ناهمگونی و اجزای آن مرتبط باشد. بنابراین، به نظر منطقی این است که به طور صریح، هر جزء مادی (هندسه و خواص مکانیکی) به ما اجازه می دهد که فرضیه سادهتری را در نظر بگیریم که حجم بزرگتر از مشکل جهانی را در نظر بگیریم.